Thirsty skin? Need more hydration? How about using a serum with a surge of moisture-rich hyaluronic acid, a blend of organic vitamins and licorice root that also enhances the skin’s radiance? Introducing the lightweight but performance heavy Estelle & Thild Biohydrate Thirst Relief Vitamin Serum. This multifunction product promises to instantly hydrate and refresh your complexion. At the same time restore luster, increase skin collagen and soften skin texture. Now the 63-dollar question is: does it deliver? My only gripe is that the brand is quite pricey considering they are only Ecocert-certified. Majority of their ingredients are of natural origin but are not from organic farming. But this Swedish skincare brand differentiates themselves with formulations containing natural ingredients of highest quality through the help of dermatologists and toxicologists. Interestingly though, the company says it does not mix too many plant extracts to lower the risk of irritability for those with sensitive skin. This is definitely unlike other green brands that boast of using mostly botanical extracts. All Estelle & Thild’s products are free from parabens, mineral oils, sodium lauryl/laureth sulfate, propylene glycol, silicone, urea, DEA, TEA, synthetic emulsiï¬ers, PEG and dyes. Their products are also not tested on animals and are environmentally certiï¬ed Nordic productions that use recyclable packaging. 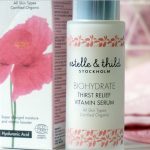 So how did I find Estelle & Thild Biohydrate Thirst Relief Vitamin Serum? Did it perform and deliver for my skin given all its glowing promises? 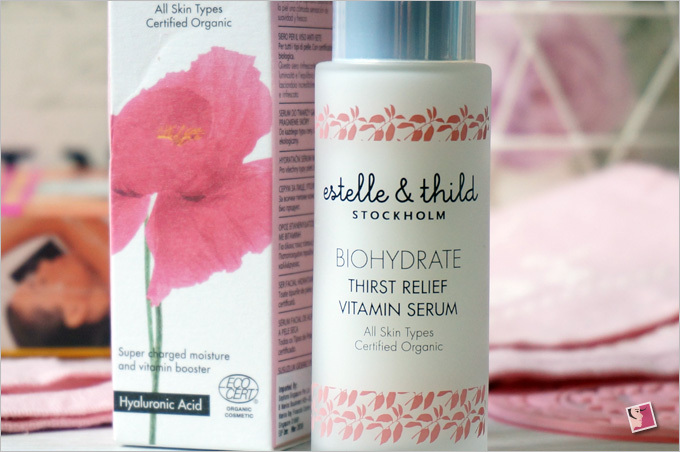 Estelle & Thild Biohydrate Thirst Relief Vitamin Serum cost me S$63 but it didn’t disappoint. I can feel my skin instantly hydrated, plump and soft. The best part is that this serum is so lightweight, non-sticky and plays nice with my other skin care products. I use this serum mostly in the day. It spreads well and sinks into my skin quickly. 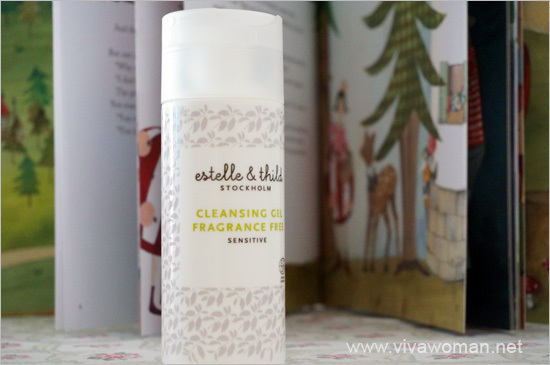 I also like that it has a light fruity scent–reminds me of Estelle & Thild Repairing Oil Complex which I’d tried last year. Although I haven’t noticed any visible radiance after using this serum but my skin definitely feels very comfortable throughout the day without any dry spots. Aqua, aloe barbadensis leaf juice*, glycerin, butyrospermum parkii butter*, simmondsia chinensis seed oil*, biosaccharide gum-1, citrus paradisi fruit extract*, gluconolactone, sodium hyaluronate, sodium levulinate, glycyrrhiza glabra root extract*, glyceryl caprylate, cetearyl olivate, sclerotium gum, xanthan gum, sorbitan olivate, sodium anisate, parfum, limonene, sodium gluconate, citric acid, sodium benzoate, potassium sorbate. * Ingredient from Organic Farming 99,900% of the total ingredients are from natural origin. 25,149% of the total ingredients are from Organic Farming. Natural and Organic Cosmetic certified by ECOCERT Greenlife according to ECOCERT Standard. Most definitely! Not only will I repurchase this serum, I’m now incline to try other products in their Biohydrate series. Even though Estelle & Thild Biohydrate Thirst Relief Vitamin Serum is not cheap at S$63 (from Sephora), the 30ml should last me about three months since one pump is sufficient for my entire face. So if you’re in the market for a hydrating serum, I’d recommend this product. It’ll do wonders to quench your thirsty skin! Give Your Skin A Boost With Algae In Estelle And Thild Super Bio Active Magic Duo Did my new Estelle & Thild Cleansing Gel go rancid? 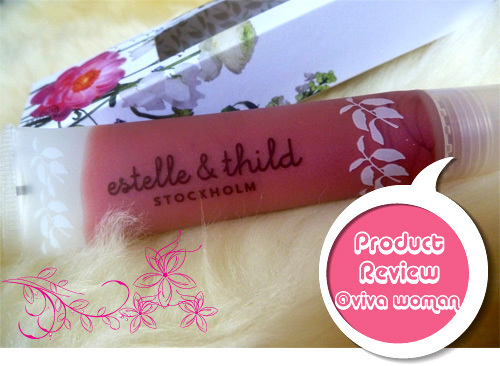 Estelle & Thild Raspberry Lip Balm review & giveaway Is Estelle and Thild Biocleanse Silky Soft Cleansing Milk Any Good For Double Cleansing? I use it after toner and before applying face oil. You can use it with a moisturizer too. Hi Sesame, what toner are you currently using? would appreciate recommendations. Nuxe Gentle Toning Lotion. I just reviewed it here: http://www.vivawoman.net/2016/08/can-these-three-nuxe-products-make-it-to-the-parisian-beauty-essential-list/. Since it’s a serum, shouldn’t it be used at night? It can be used both day and night. I don’t use it in the night because I am using other serums at night so this one is kept for the day. Between this and Antipodes serums, which do you think works better for you? I am currently using the Antipodes Skin brightening and Skin plumping Serums. I seem to like this one better…somehow Estelle and Thild’s products work better for my skin. Please do a blog post about your current skincare routine! I am very interested.